Our team of dedicated Treatment Coordinators are on hand to provide a free first stage consultation. 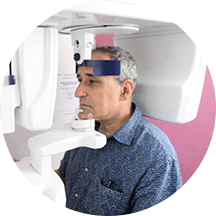 They will not conduct a full examination, but will take photos, talk through your general medical history and, from this, will be able to provide you with some general information about the different implant treatment options which may be suitable for you. They will also be able to give you some ball park figures on what these different options would cost. The next step would be to meet with one of our Implantologists for a full examination and consultation where detailed xrays will be taken and our expert surgeons will be able to fully talk through a proposed treatment plan and give you a more accurate breakdown of costs. Once you have had a chance to fully digest the proposed treatment options and have decided to go ahead with treatment, you will return to the practice for a CT scan (3D) and have moulds taken of your mouth. From this we will be able to show you a mock up of the end result we believe we can achieve for you. This would also be the time when we would talk through any other functional or cosmetic treatments you may require on any of your other existing teeth. 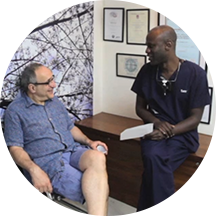 We will also talk through timings and schedule for your treatment to suit you. During surgery, you will be given a local anesthetic (unless sedation is specifically requested or deemed necessary) and we will remove any teeth and place the implants during the same procedure. This will take place under sterile conditions in one of our treatment rooms. At this stage, you may or may not have a temporary tooth fitted if this is required. After the bone has totally healed, generally 3 months, you will return to our surgery. At this stage we will uncover the implant, a simple surgical procedure under local anesthetic, and a metallic dome called a healing cap will be fitted. The final few steps to new teeth We will wait a couple of weeks for the gum to heal around the healing cap and will then bring you back in to take impressions and within a couple of weeks you will be fitted with your new teeth! Two weeks after fitting you with your new teeth, we will review how you are getting on and make any adjustments if necessary. We will then see you for regular check ups over the coming year. 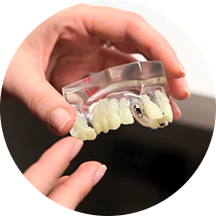 The issues patients have faced in the past with traditional bridges, is that the neighbouring teeth must be shaped and filed down, despite the fact they are healthy and fully functioning – this can have long term consequences. Dentures often feel loose, can cause irritation and pain. Implants, on the other hand, have no detrimental effect on the adjacent teeth; they are fixed and fully integrated into the body’s own tissues and stimulate and maintain the bone around them, just like the natural teeth they replace. A titanium ‘root’ replaces the root of the tooth which has been lost. The implant is used to permanently anchor one or more crowns to enable the patient to eat, speak and smile with confidence. Whether you are missing one tooth, or all your teeth, we are able to offer a variety of solutions to suit a variety of budgets. To ensure we always achieve the optimum result, we insist on only using implants from recognised manufacturers, which have a proven clinical track record. The bone around a tooth begins to diminish as soon as that tooth is lost.The sooner an implant can be placed, the more chance there is to save the bone and achieve the optimum outcome for a patient. 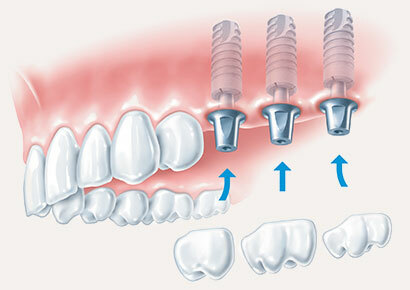 In most cases, implants are placed under a local anaesthetic. 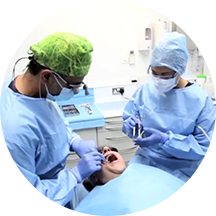 After this small operation, a patient is likely to experience minor discomfort which can generally be treated using over-the-counter painkillers. If you are a nervous patient, we can place you under sedation (also known as twilight sleep) during the treatment.